The figures and Supplementary figures of this Letter are affected by errors and improper editing. The correct figures are now provided, with an explanation of the variations. The original Letter has not been corrected online. We apologise for the confusion that our errors could have produced. We admit our negligence in the supervision of technical activity. We acknowledge that image manipulation is not acceptable and that any image modification must be clearly described. None of the alterations have any direct impact on the validity of our conclusions, which were also substantially confirmed in papers published by other independent groups1, 2. In Fig. 1b, the left panel was generated by joining different fields acquired from several pictures in which the density of nuclei was very low. This was not apparent in the original figure because no border limits the individual acquisitions. This does not affect the interpretation of the results, which was based on the direct observation of a large number of cell nuclei by a senior investigator that gave the frequency of euploid versus aneuploid cells in each case preparation. The figure is only intended to show the appearance of different patterns. The same correction has been made in the right panel. Figure 1b, now showing the eight separate images, is corrected below. The master pictures of the figure are available as Supplementary Figs 1 and 2 of this Corrigendum. In Fig. 1c, two parts of the same picture were cut, flipped and moved closer to save space in the figure. However, the upper and lower panels of Fig. 1c partially overlapped. In Fig. 2b, the panel showing the uptake of LDL by HMVEC (bottom image only) erroneously showed a duplication of the GBM patient panel. The HMVEC panel of Fig. 2b is corrected below. The massive correction, which Karin Wiebauer brought to our attention, includes the corrected figures, and continues in the Supplementary Information. The original paper, published in late 2010, has been cited 69 times, according to Thomson Scientific’s Web of Knowledge. An earlier Nature paper by many of the same authors has been cited more than 1,000 times. We look forward to hearing what Retraction Watch readers think. There should be a third category, re-issue, where a paper is seamlessly retracted and then published in a brand new form. I disagree. There should not be a shifting version of the paper over time – just following the new literature is hard enough without having to worry about the content of the existing literature changing as interpretations are refined. The threat of retraction (or mega-correction I suppose) also helps keep the quality of papers high. If an author knows he/she can fix the errors later, we will see a lot more shoddy work pushed out the door before its time in a race to be the first to publish important findings in fast-moving fields. I disagree with the practice of mega-corrections in general, though I do draw a distinction between mega-corrections that invalidate a portion of the conclusions of a paper and those that do not. Certainly there is a gray zone. I agree with Special Guest Lecturer. The published version should not morph over time. Other authors might end up appearing to cite something that is entirely different from what they thought they were citing. And I agree that authors should not be encouraged to publish it quick and fix it later. The incentives to publish often and partially (slicing the salami thin to make it go farther) instead of less often and completely cause enough trouble already. Although it would not be possible with the print version, I wonder if on-line versions could be modified in ways that retain the original while signaling that changes have been made. I always like to see the original paper still in place, although stamped with a big, red “retracted” sign. Removing things as if they had never been there and changing the content without notifying the reader are too much like “1984” for me. But as things stand, the published version HAS morphed over time, yet it’d be a rather messy job to put it together. Anyway…I am amazed that in the days of hyperlinks, trackbacks and wikis we’re still discussing “papers” as if they had to remain forever “on paper”. Time for the Web 3.0?? Indeed. That’s why I wondered whether there might be a way to make amendments or corrections without obliterating the original, similar to the idea of never erasing an original note in a lab notebook, but rather drawing a single line through it and adding what the researcher thinks is correct. The original note may turn out to have been correct after all, so you don’t want to erase it. Pretending that you never wrote it down at all is dishonest, even if you later decide that it is a mistake. Writing the correction somewhere else makes it difficult to connect the correction with the item to be corrected. This has certainly been a problem in print editions when copies cannot be recalled and marked in red as retracted or corrected. The internet could be a wonderful way to solve this problem, but just a link to the correction doesn’t seem sufficient to me. I would like to see the correction right there beside the original words or pictures, so it’s not possible to miss it in a rush and it’s not necessary to go away to another page. Ideally the correction would even print out alongside the original if a reader wanted to print the page, so I don’t want to see little note icons that expand when clicked. I may be asking for too much, but anyway … It would add to the chronicle of science history if we could easily follow the retractions/corrections and perhaps analyze the progress and account for the false starts when it is a case of honest error rather than fraud. In general, I find the use of extensive supplementary figures and minimal description of methods to be a disturbing trend. Beyond that, I think there is a common theme to many of these basic science retractions – the primary data is seen (and critically reviewed) by a small number of people (one?). Within a lab, and within collaborative efforts, you have to be able to share and discuss primary data (messy, embarrassing, confusing, etc.) to trust that the conclusions being disseminated to the scientific community are the best and most honest efforts of your group. True, some papers are two pages long, with 20 pages of Supplementary materials. absolutely right. Sometimes the results section start with a supplementary figure. I always suggest the authors put it as main figure in the manuscript. If it is an online journal, why supplementary figures? Publishable amendments requested by the authors of the publication are represented by a formal printed and online notice in the journal because they affect the publication record and/or the scientific accuracy of published information. Where these amendments concern peer-reviewed material, they fall into one of four categories: erratum, corrigendum, retraction or addendum, described here. Corrigendum. Notification of an important error made by the author(s) that affects the publication record or the scientific integrity of the paper, or the reputation of the authors or the journal. All authors must sign corrigenda submitted for publication. In cases where coauthors disagree, the editors will take advice from independent peer-reviewers and impose the appropriate amendment, noting the dissenting author(s) in the text of the published version. Retraction. Notification of invalid results. All coauthors must sign a retraction specifying the error and stating briefly how the conclusions are affected, and submit it for publication. In cases where coauthors disagree, the editors will seek advice from independent peer-reviewers and impose the type of amendment that seems most appropriate, noting the dissenting author(s) in the text of the published version. Addendum. Notification of a peer-reviewed addition of information to a paper, usually in response to readers’ request for clarification. Addenda are published only rarely and only when the editors decide that the addendum is crucial to the reader’s understanding of a significant part of the published contribution. Call me cynical – and why not?, many people already do – but I do not buy the eyeballing by a “senior researcher” as a scientific evidence. Afterall, it’s supposedly the experimental science, not UFO research. There are ways to document observations, or if there aren’t any, don’t be in such a hurry to get into Nature. Conclusions being confirmed by other groups in principle sound good, but in reality a) publication of Nature- or Science-caliber paper can sway other people in interpretation/selection of their own data, and b) digging around in Pubmed one can often find works supporting just about any view. The length of the corrections shouldn’t matter. It should only ever depend on the reliability of the results. Perhaps someone qualified can better assess the impact of this correction, but it sounds to me like they could have published the same image with a caption that said “composite image” without changing any of their conclusions. A better idea than a caution in the caption is to leave a narrow strip of white space between the components that have been artificially put together for comparison. Sometimes doing things like that on a gel or blot is unavoidable — you don’t always know which comparisons you’re going to want to make when you’re loading the thing, after all — but it’s critical to be transparent about which lanes were originally on the same gel and contiguous and which weren’t. Even the smallest visible separation accomplishes this. It’s no harder than mashing them together, and there’s absolutely no reason not to do it. Special Guest Lecturer – I don’t understand your objection to a reissue of an article. How would that make the situation even more worrying than it is now? OTOH the correct version of a paper would be clear for all to see. A reissue would only replace current slightly ridiculous “mega-corrections”. Was trying to look at the pictures again, got this^ Did we break Nature?!! Some of the mice have ulcerating tumors, and in some the tumors are more than 6cm3 in size. the MGH Subcommittee on Research Animal Care? Why are the Editors at Nature and its reviewers apparently unaware of the generally accepted guidelines for animal welfare? Yes, those tumors are far too large. Those animals should have been euthanized when those tumors were much smaller. The image is very inhumane, in my opinion. Agree. All four of the animals on the right should have been euthanized a long time ago. Even the animals under active treatment didn’t look too good. If you scale it up to human size it’s horrific, like those medieval Japanese cartoons of men with giant testicles. Refined cruelty, anyone? From a clinical point of view. It would not surprise me if they violated their own IRB. The MGH IRB and funding agencies should investigate. In their correction, Ricci-Vitiani et al. write: “None of the alterations have any direct impact on the validity of our conclusions”…… Fair enough… but I just had a look at the original supplementary figures. I see something quite inexplicable when I closely compare S2d with S9c. Do you see what I see?? Any FISH expert out there??? How the hell could that happen???? I don’t see what you mean. Care to elaborate? Neoplastic cells are a rare component in human glioblastoma microvasculature. Rodriguez FJ, Orr BA, Ligon KL, Eberhart CG. SourceDepartment of Pathology, Division of Neuropathology, Johns Hopkins University. Microvascular proliferation is a key biological and diagnostic hallmark of human glioblastoma, one of the most aggressive forms of human cancer. It has recently been suggested that stem-like glioblastoma cells have the capacity to differentiate into functional endothelial cells, and that a significant proportion of the vascular lining in tumors has a neoplastic origin. […….] To more directly address the capacity of glioblastoma cells to contribute to the vascular endothelium, we performed double labeling (Immunofluorescence/FISH) for the endothelial marker CD34 and EGFR gene locus. This analysis did not identify EGFR amplified CD34+ endothelial cells within vascular linings, and further supports our observation that incorporation of glioblastoma cells into the tumor vessels is, at best, extremely rare of questionable clinical or therapeutic significance. There’s another problem here. If you look at the pictures, there are four mice on the left, treated mice, and their tumors average (I would guess, very roughly) a minimum of 1/2 cm cubed each. If I am reading the graphs correctly, the average tumor size in treated mice was less than a quarter of a cubic cm. Why didn’t they show the good mice, if that was so? Where are the healthy mice, if the graph is correct? I’m referring, of course, to the other paper, the one Michael Briggs cited. Sorry. 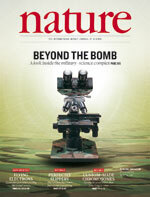 So let’s consider what that means for the other megacorrection in Nature, http://www.nature.com/nature/journal/v481/n7382/full/nature10789.html. According to Nature’s policy, all the authors of the correction to this paper must have signed the corrigendum, which not only shows mice that have been treated inhumanely, and in gross contravention of the animal ethics conventions in both the UK and the NIH, it also (as pointed out by puzzled monkey) depicts results in a graph and in pictures that are completely inconsistent. For the Tumour vascularization paper, even after the megacorrection, suspicious data remain (as spotted by Robert); in the paper by Raj et al., the megacorrection includes incompatible data as well as evidence of animal abuse. Independent peer-reviewers might have spotted this. If Nature does indeed have the signatures of all of the authors of the Raj et al. corrigendum, then all of them should have to take responsibility for breaches of animal ethics regulations. Nature might benefit by obtaining advice from independent peer-reviewers for everything it publishes, and it might even benefit from advice from COPE on how to manage cases where it is apparently condoning abuse of animal welfare, and publishing results without peer review. Of corse, Nature thinks of itself as too good to be part of COPE. If you compare the original supplementary figures S2d with S9c, which illustrate two different experiments, you will find the same nucleus in both panels (it is flipped). This could be a duplication error due to the authors’ “negligence in the supervision of technical activity” (as stated in the corrigendum). However, there is a major scientific problem here. The two nuclei (indeed it’s the same one) show 2 green dots in one case, and three in the other. This suggests Photoshop editing, as indicated by Michael, unless you have an alternative explanation… I don’t, so please help! Note that the main conclusions of the paper were based on those genetic analyses. Needless to say, this problem was not addressed in the Corrigendum. In fact, you find three identical nuclei in S2d “tumor, upper” and in S9c “Vascular”. Two other nuclei in S2d disappear in S9C and are replaced by the two nuclei with the red mChr-staining. So we have composite images like what the authors describe as an error in main figure 1b and there is a reuse of nuclei with changes in hybridisation signals, that are indeed difficult to explain……In the corrigendum, S3 replaces the original S9c to correct this “error”, while the original S2d and e are replaced with corrigendum S5. Unfortunately, unlike what the authors claim in their corrigendum, they do not explain, they don’t even list the errors in the supplemental figures. They don’t even write which of the corrigendum-supplementals replace which of the original-supplementals. You can really only tell because of the respective identical figure legends. How can nature publish such a confusing and somewhat misleading corrigendum, even if it’s “only” the supplementals? There are two ways (at least) to get a figure that is flipped 180 degrees from another: scan the same film twice, once flipped over; or use the flip command in Photoshop. The first might be an error, but the second is deliberate. The disappearance of one of the three green dots, it seems to me, has to be deliberate. The combination of those two differences in what is arguably the same figure in two different papers is quite suspicious. “To make one error…” That’s actually three “errors”, isn’t it? To follow up on Maxine’s earlier point (Feb 17) has anyone commented on the fact that PubMed does not distinguish Corrigenda from Errata, and presents them all as Errata? Furthermore you can’t link from PubMed to the Corrigenda – you have to note down the page and issue and find them manually within the journal’s website. Given that most people no longer have the time or inclination to do this, you could say that Corrigenda are virtually invisible. Scopus SciVerse at least shows them as separate publications, but still mislabels them Errata.